After having a lovely city break in Rome last year, I couldn't wait to go and explore another European city. I honestly have a travel wish list a mile long and have been dying to go away since my last holiday in September to Marbella. My love for travelling began after my trip to Rome and also contributed towards my decision to go travelling for three months from June to September (Mauritius, Bali and Australia here I come!!). One of my friends had an event in Berlin, so suggested I tag along before it all started and we could explore the city. We arrived in Berlin at Tegel Airport (Berlin has two airports FYI, the other is called Schönefeld Airport) on a Friday and we went straight to our hotel, we got a really good deal to stay at the Softel Berlin Kurfürstendamm and their beds are the most comfortable thing I have ever slept in. I felt like I was sleeping on a cloud or wrapped up in a cocoon, the bed was that comfy and soft! It is a beautiful hotel, the rooms are an impressive size and it is right near the Kurfürstendamm Meinekestraße + Berlin Zoo. We took it easy on our first day their and went for lunch just round the corner at a traditional German restaurant. I had my first schnitzel and absolutely loved it, their portions were massive and well priced so suffice to say I didn't go hungry. We then chilled for the rest of the afternoon which included a little wander of our surrounding areas and ate in the evening at L'Osteria, which has a great ambience and food! 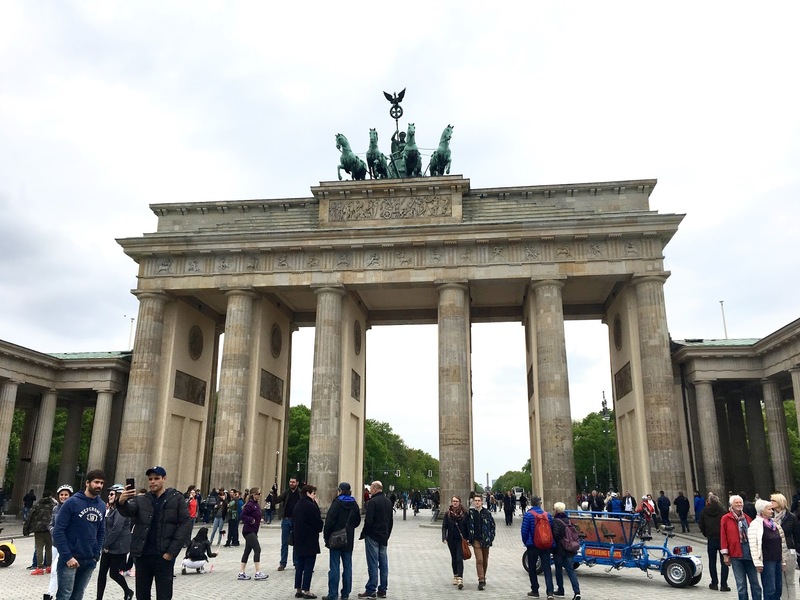 Our Saturday consisted of sightseeing, which was done with the incredible Gray Line Berlin Bus Tour and allows you to hop on & off as many times as you wish. We choose to do the Yellow Tour that costs €22 as it was recommended to us by the ticket officer and you can see all of the essentials with that one. The Yellow Tour has 18 stops: Kurfürstendamm Meinekestraße, KaDeWe, Lützowplatz Hotel Berlin, Kultuforum Philharmonie, Potsdamer Platz, Checkpoint Charlie, Gendarmenmarkt, Alex/Fernsehturm, Neptunbrunnen Fernseturm, DomAquarée, Berliner Dom Museumsinset, Unter den Linden Friedrichstraße, Brandenburger Tor Reichstag, Hauptbahnhof, Siegessäule, Straße des 17. Juni Flohmarkt, Schloss Charlottenburg and Antiquitatenmeile. Having not done a sightseeing bus tour since I was a little girl (of which I was too young to remember), I've always thought they were a little bit overpriced and oversaturated but I am happy to say I am now a convert! Sightseeing bus tours where you can hop on & off are incredible and perfect for seeing the sights when you are only in a city for a short amount of time, as they take you to all of the essential places and allow you to have a wonder around the area. I really wish I had done one when I was in Rome as it would have made things a lot easier and less stressful!! Going on the sightseeing bus tour also gives you a lot more information you wouldn't learn otherwise, even if you decide not to get off at that stop and those little nuggets of information about their history were really interesting. The Berlin Wall was strangely intriguing and being born in 1994 myself it is weird to think that there was a time when a country in Europe was divided by a massive wall. Even more horrifying that if you tried to cross said wall to get from East Berlin to West Berlin the guards shot you on site. There were boards of in-depth history near the Berlin Wall in the Topography of Terror Museum where you could learn all about the lead up to the Second World War, everything that went on during the war, the aftermath and the eventual building of the Berlin Wall. Also, near Checkpoint Charlie there were boards explaining what it was like during the divide of Germany and the stories of people who tried to escape to West Germany (successful and unsuccessful). After going round the Berlin Wall and Checkpoint Charlie we then went on to Gendarmenmarkt area, where we took a couple of pictures and then went on to visit two lovely chocolate shops. The first chocolate shop we went to was Rausch Schokoladenhaus and has a very elegant + upmarket style with a red carpet leading into the shop and a variety of incredible chocolate Berlin landmarks. It is like being transported into a different world in there, a chocolate lovers heaven and there is so much variety in there, I only ended up buying one thing for my family as I couldn't decide. The second chocolate shop was Ritter Sport, which is slightly cheaper than the first shop but equally just as good! They had a variety of different chocolates a mile long and flavours you wouldn't even think of putting in chocolate. Ritter Sport also had a make your own chocolate counter where you can make your own personalised chocolate bar with any toppings you want, which makes a cute gift for your loved ones. Our next stop after Gendarmenmarkt was the Brandenburg Gate and it is as stunning in pictures as in real life, I would recommend getting there really early if you don't want a very busy photo as it was packed when we got there. It was still lovely to see nonetheless! One of the sights I also really wanted to see was the Charlottenburg Palace which was built for Queen Sophie Charlotte as her summer residence a couple hundred of years ago and it is a simply breathtaking building. We only saw the outside but I will definitely be visiting the inside when I go back as it is even more stunning than the outside. Google it and you will be soon wishing you lived there too! I could honestly go on for hours about all of the interesting sites we saw but I won't bore you to death and could not recommend the tour more! It is fantastic value for money and there is no limit to how many times you get on/off. After a day of sightseeing the day before, we wanted something a little bit more low key and after failing on my part to find the easiest way to get to Museum Island (I can't map read in Britain let alone a foreign country and figure out exactly what mode of transport we needed to get), we opted to go to Berlin Zoo. Our two previous days had been a mixture of rain and cold, so it couldn't have been more perfect weather for sunshine on the Sunday at the Zoo. Berlin Zoo is honestly incredible and is such good value for money, it cost €14 for an adult ticket. The zoo is massive and we leisurely spent the afternoon wandering around it until it shut. They have all kinds of animals there including elephants, giraffes, tigers, bears, wolfs, penguins, rhinos, farm animals and so many more... It was so lovely to walk around and something about seeing animals just makes your day all that much better, I would definitely go back for the mere peacefulness of it all! It is a perfect day out if you have kids or if you are stuck on what to do. I had a great long weekend and will definitely be going back to Berlin at some point, it is such a lovely area and very reasonably priced for a capital city. I also learnt so much more about the history of Berlin and having lived in France for 7 years I have a good grasp on their history, so it was enlightening to learn all about the Second World War from Germany's point of view and the devastation that continued afterwards with the Berlin Wall. When I go back, I definitely want to go to visit Museum Island, the inside of Charlottenburg Palace and Reichstag Parliament Building. There is so much to do there and you could go back multiple times without being bored. It truly is an amazing city!